The iWALK Chameleon iPhone 6 Power Case is equipped with a 2400mAh lithium polymer battery to charge your iPhone 6(s) fully. The LED battery indicator shows charge and discharge status, and the sleek design and easy-grip exterior give it a great feel. Its ON / OFF switch preserves power and allows you to keep the case on your phone when not in use. You'll also have full access to all controls and ports. The earphone jack port provides complete access even for L-shaped plugs. 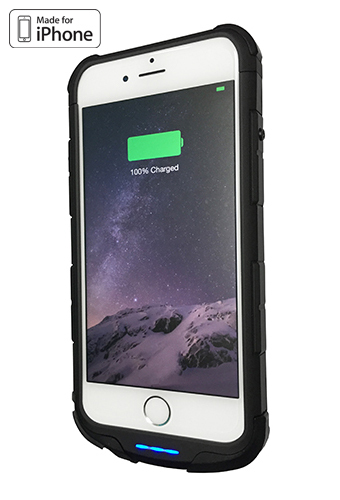 Pass-through technology allows you to charge your power case and iPhone 6(S) at the same time.